In June, I cheated a little bit. Well, quite a lot actually I suppose. I completed three books, but only one of them was on my Off The Shelf list, and one of the others was so tiny it hardly counts. 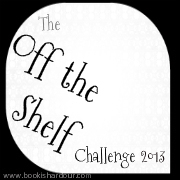 The first book I completed was the only one on my Off The Shelf list: The Wise Man's Fear. It was an excellent follow-up to The Name of the Wind and I'm looking forward to the final book in the trilogy, which is supposed to be out next year. There's an awful lot of story to cover yet, so I'm not sure how Rothfuss is going to cram it in to one book. Goodreads also says I read All My Friends Are Dead in June. I did, but it's 96 cartoon pages so I'm not sure it counts! It was a birthday present from Miss RBit and really cute. But not on my Off The Shelf list! Finally, I also read Vernon God Little in June, another book not in my Off The Shelf challenge. I didn't enjoy it as much as the friend who lent it to me, and only gave it 2 stars. The Deus ex machina feel of the ending really put me off, although the book and story overall were okay. Note that it deals with the aftermath of a shooting at a high school. We're a week in to July and I'm halfway through American Gods with a plan to finish it this weekend. The same friend who lent me Vernon God Little has lent me another book: The Sense of an Ending. It's only 150 pages (but not on my Off The Shelf list!) so I may knock that off this weekend too. In a week I start a two-week holiday (vacation, for American readers, and no, it's not a Summer vacation, it's winter here!) and I expect I will get a lot of reading done, because I always do. So hopefully July shapes up to be a good month. If you want to see my rating and/or review of each book, check out my Goodreads page.